The Double Agent II Forged from the toughest materials and finished to the highest standard to offer high performance without the high price. The Grivory handle will provide a comfortable yet grippy surface to give you the comfort and control you require when using this unmatched tool. The double ring is the main feature allowing you to put as much force into cutting, without having to worry about the high chance of injury. The index finger slides into the loop nearest the blade and your little finger in the one furthest from the blade. To prevent your hand/fingers sliding towards the blade and risking injury. The blade forged from the toughest, highest quality 8A stainless steel will not fail you during use. The razor sharp edge will slice or cut though even the hardest materials.The 3" clip point blade makes it great at piercing materials whilst also providing a good reach. 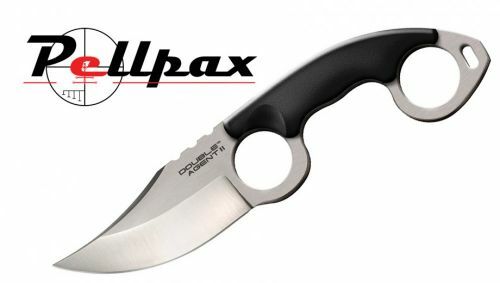 This knife is available in plain edge or serrated edge. Add this item to your basket & spend an extra £456.61 to apply for finance.